My wife and I were having our coffee one morning when I mentioned that I would love to hear Herbie Hancock live in concert. As for jazz pianist, he is at the top of my list. A quick check on the internet showed he would be performing in my home town of St. Louis in March. Reservations were made and the next thing I know I had tickets. Yay! My longtime friends, Ernie and Susan Planck, offered to provide a place for me to stay. I was happy to get extra tickets so that they could attend the concert with me. Concert was great and hanging out with the Planck's was great fun. Herbie is truly an inspirational musician. At times he seems to approach the instrument very much as a precision instrument which, of course, is what it actually is! 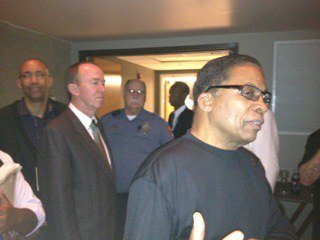 We attended the "meet and greet" after the concert hoping to meet Herbie. As shown in the photo, I almost got close enough to meet Mr. Hancock personally. After looking at the photo, my wife said it looked like I was "stalking" Herbie.